Physical and political map with raised relief. Shows natural coloration of the earth. Blue oceans show undersea physical features. Full swing meridian mounted on a metal base. Physical and political map with raised relief and a full swing meridian. 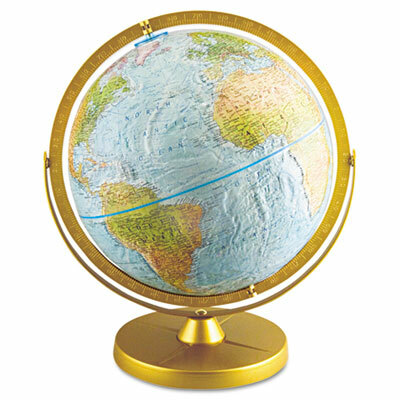 Shows natural coloration of the earth to illustrate mountains, deserts, forests and grasslands. Blue oceans show undersea physical features. Mounted on a gold metal base.